If you're looking for a mid-range tablet with service, Sprint is offering the Samsung Galaxy Tab 3 (7 inch) for $49 on Friday October 11. Details inside! But if you’re not spec crazy and you’re looking for a price break, this might be the time to get the tablet. 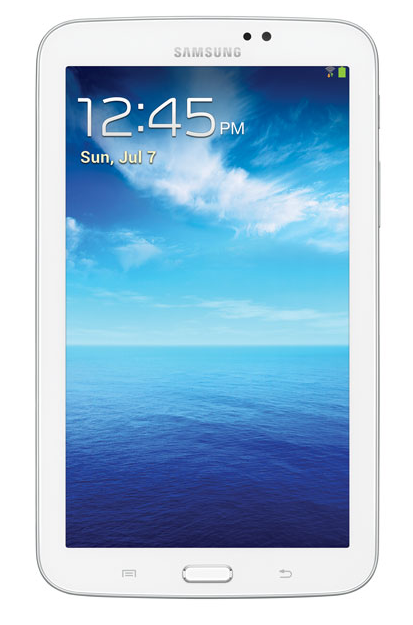 Sprint is only asking for $49 for the Samsung Galaxy Tab 3 (7 inch). That’s insane price right there. It gives you the chance to pay off a tablet slowly. I’d recommend it for families that share tablets or are already on Sprint. The 7-inch Galaxy Tab 3 features Android™ 4.2, Jelly Bean, Sprint 4G LTE, where available, a 3-megapixel rear-facing camera with video capture and 1.3-megapixel front-facing camera for video chat. Sprint customers can add a data plan for Galaxy Tab 3 7.0 to their account for as little as $5 per month (excluding taxes and surcharges). Customers can also take advantage of Sprint One UpSM, a new upgrade program that gives customers the ability to upgrade their smartphone every 12 months. Buying a tablet for the first time? Galaxy Tab 3 makes it easy for a first-time tablet owner or experienced user. · Galaxy Tab 3 has a similar look and feel to Galaxy smartphones, so users find it intuitive to use. · Connect to loved ones from afar using the clear 1.3-megapixel front-facing camera on Galaxy Tab 3 for video chat in Google Talk, Skype and more. · Samsung Hub™ makes it easy to buy music, books, movies and games with a full library of content powered by some of the biggest names in entertainment on Galaxy Tab 3. The apps can also be accessed freely on any Galaxy device. · Enjoy access to more than a million apps from Google Play™. Already own apps on a Galaxy smartphone? Then easily access all those already purchased apps or download more on Galaxy Tab 3. Managing a household and relaxing at home have never been easier. Galaxy Tab 3 includes a variety of features that make it easy to relax and enjoy some free time. · Samsung WatchON™ is the ultimate TV and movie app – recommending programming based on personal tastes. Built with the same IR blaster as a standard TV remote, Galaxy Tab 3 can be used as a universal remote control for almost any TV or DVR, so users can change the channel directly from the tablet. When paired with a Samsung Smart TV, users can enjoy a seamless experience between Galaxy Tab 3 and TV – start a movie on the TV and continue watching it on Galaxy Tab 3. · Galaxy Tab 3 offers a brilliant display, making it a favorite device for game lovers. · Small enough to take anywhere1 and large enough to easily read, Galaxy Tab 3 makes it easy to relax with a good book or magazine with access to some of the top bookstore apps. Galaxy Tab 3 is incredibly portable, making it easy for the mobile workforce to get work done when away from the office or meeting with customers. · Polaris® Office is preloaded, allowing users to edit Microsoft Word, Excel and PowerPoint files from anywhere. · Group Play™ lets users share a game, photo album or presentation in real time with multiple friends on select Samsung devices using Wi-Fi®. · Samsung for Enterprise (SAFE™) ensures that businesses have the security and control they require to protect the company. · Quickly and easily access corporate email, meeting details, contact information and other critical information. · Securely store sensitive proprietary documents, presentations and other corporate data on a mobile device. · Wirelessly and securely access data from a corporate network while travelling or working in the field. · Employees using their personal smartphones in a company’s Bring Your Own Device (BYOD) program remain mobile, secure and compliant with remote management of applications and device features that meet company-specific security requirements. Sprint continues to bring a better wireless experience to customers across the country as it builds out its all-new 3G and 4G LTE network. Sprint now provides 4G LTE service in 185 markets nationwide and is aiming to provide LTE to 200 million people by the end of 2013. For the most up-to-date details on Sprint’s 4G LTE portfolio and rollout, visit www.sprint.com/network.